Last year I read, and loved, the first book in James S.A. Corey's science fiction space opera series, The Expanse. As the first book, Leviathan Wakes sets up the trilogy perfectly, and in Caliban's War development of the world, characters, and circumstances are magnified and expanded upon. The writing team that makes up James S.A. Corey, Daniel Abraham and Ty Franck, borrowed from different genres to set up this series. This is a space opera, which means lots of action adventure in space with a wide variety of characters, but so far there are also strong elements of a mystery/thriller in both installments. The authors made this blend of genres work. Science Fiction: The Expanse series features the space battles and action that are expected of a space opera. Those battles are described in detail, but not to the extent that a military sci-fi story would take such scenes, instead they are quick and to the point. The same can be said for science details, explanations are given to satisfy, but more often than not the little nitty gritty details often found in hard sci-fi are not there. Readers looking through a magnifying glass for in-depth scientific details will be disappointed, while others, like me, will be thoroughly satisfied. Other Elements: Because the battles are fast and furious and the scientific details are part of, but not central to the story, the reader focuses on the rest: the plot that drives each story, the characters that populate them, the overall story arc and the atmosphere. In addition to science fiction action adventure, there are other elements that made both books excellent reads for me. In Leviathan Wakes it is the noir mystery/thriller detective aspect of the story, mixed with more than just a dash of horror. Caliban's War has the mystery/thriller with a healthy dose of political intrigue added to the action, and while the physical horror is less prominent, it takes on a more psychological flavor. The World: The world is our own solar system. The Epstein Drive allowed humanity to reach the outer planets in our solar system, including the Belt, if not the stars. Natural resources give Earth its power while Mars holds the technological advantage. Although allies, Earth and Mars are fierce competitors that see each other as possible enemies -- political games and jockeying for power abound -- and there's always the possibility that open war might ignite. Belters are at the bottom of the food chain. The engineering genius of Tycho Manufacturing and Engineering Concern allowed humans to populate the artificial environment of working stations in such places as Ceres and Eros, by building reaction drives that allowed asteroids to spin, as if on an axis, and stabilized the massive rocks, creating huge artificial planets. Because of the artificial environment -- low gravity, artificial air and light and confined spaces -- throughout the centuries Belters have physically mutated to accommodate that environment. The Conflict: The main conflict is one where the major players, Earth and Mars, are fighting for power, with Belters playing the role of underdog. Major corporations, political games, greed and fear all play a major role as our main characters find out throughout the course of their adventures. Alien presence is not exactly physical, but takes the form of a protomolecule sent to our solar system, finally proving that there is something "out there" and that "they" have either been or are trying to get "here." The race to own the protomolecule is what it's all about, and of course to the greedy, the end justifies the means. Leviathan Wakes is told in the first point of view from the alternating perspectives of the two main characters: Captain Jim Holden and Detective Miller, with the first chapter told from Julie's point of view. This splits the story into two: a space adventure and a detective story, with both halves meeting and mixing quite effectively in the middle to provide the thrill. The mystery in Leviathan Wakes is followed by a "nourish" character that could have stepped straight out of a pulp fiction novel. Detective Miller, the depressed, and cynical Belter who becomes obsessed with finding and saving a young girl serves as the "mood" setter for the novel with his pessimistic and cynical views. Miller needs to save and be saved, and Julie is his answer. When I visualize Miller, I see him in black, white and different shades of gray, never in color. Color is saved for Holden from whose perspective we experience the space adventure. An Earther, Captain Jim Holden is a terminal ideologist and rather naive. 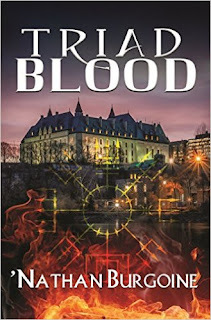 With his linear way of thinking, Holden is portrayed as a straight shooter who thinks that if he tells the truth as he sees it others will do the right thing, and more often than not winds up causing mayhem. However, Holden's character serves to counterbalance the pessimism and cynicism that Miller brings to Leviathan Wakes. If Holden balances out Miller, Holden's mixed crew helps to balance Holden's character. Naomi, a Belter, Alex, a Martian and Amos, an Earther, all provide that much needed backup that a Captain in a science fiction adventure needs, with Naomi serving as the romantic interest in the story. The action is fast and furious, almost non-stop, for Holden and his crew as they race to save themselves and the solar system. The plot takes the characters, and the reader, into a world where humans turn into the unknown by the unknown, making room for incorporating some pretty horrific scenes as greedy and unscrupulous humans experiment with what they see as alien technology. The 'whodunit' is full of twists and turns with an unexpected final truth that will change humanity forever, and one that also provides an exciting and organic ending to this first installment in the series. Leviathan Wakes is the first book in this science fiction opera that has all the action and enough science fiction details any reader would expect of just such an endeavor. Yet for me, the amazing characters and the excellent mystery/thriller in this fantastic space adventure are the ones that lifted it from being just another tale about space ships, spectacular battles and chases through space. This book is a big winner for me all around. Caliban's War has a different atmosphere. 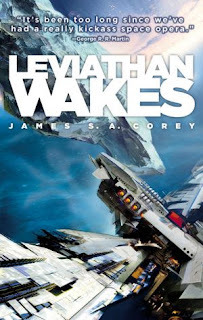 There is a new mystery to follow, but the "noir" atmosphere found in the first book is lost as the James S.A. Corey writing team adds new characters to the mix, further develops the world and expands the overall story arc introduced in Leviathan Wakes. The story is again divided into alternating chapters told in the first point of view from the perspective of the main characters. However, in Caliban's War there are four narrators: Holden, Prax, Bobbie, and Avasarala with the first chapter narrated by Mei. Interestingly enough, there are still two halves to the story as Holden and Prax quickly team up to provide a combination of space adventure and mystery/thriller and Avasarala and Bobbie do the same to provide the political intrigue and the rest of the details necessary to solve the mystery. Prax is a botanist at the agricultural Ganymede Station where Bobbie is a Marine for the Martian forces. When a monster kills UN Marine Forces and all of Bobbie's crew as they each patrol their sides of the fields, leaving her as the only survivor of the incident, The shooting is misunderstood and a battle breaks out between Mars and Earth, damaging and dooming Ganymede Station. Bobbie is lifted from the station and taken to Earth and the UN where she meets Avasarala and enters the world of political intrigue. Meanwhile, Prax rushes to pick up his daughter Mei so they can evacuate, but finds that she is missing along with 15 other children suffering from the same illness. Desperate, Prax lingers on the station looking for his missing daughter and unable to find help from the authorities begs help from Holden who just arrived with his crew at the station under OPA orders to check out the situation. The race is on again for Holden, Prax and the Rocinante's crew as in the process of looking for Mei they find residue of the alien protomolecule that was thought to be under control or only found at Venus. Fear takes over, but worst than that are the questions: What was that thing? Who has been tampering with the protomolecule? Everybody is pointing fingers, war between the planets is imminent... and Venus is still changing. Soon it becomes clear that while some are looking at the trees, others are looking at the forest and that winning this war means more than just grabbing power. 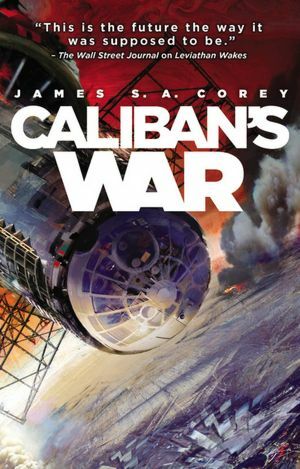 Caliban's War is a great follow up book to Leviathan Wakes. The characters are not a disappointment either. There's character growth for Holden, Naomi and the crew, plus the romantic storyline between Holden and Naomi continues, conflict included. Avasarala, as assistant to the undersecretary of executive administrator at Earth's UN, is the best new character introduced to the mix -- a little tea-drinking grandmother that makes a foul-mouthed sailor sound like schoolboy (dang can she swear! ), she is a tough-as-nails politician who plays the "game" to win or die. I again found the action to be excellent, even though there was element of predictability during the battles. There is a great resolution to the conflicts presented in this installment, and yes... the ending left me holding my breath! Not a cliff hanger, but it definitely left me wanting more, now! Conclusion: Leviathan Wakes is an excellent beginning to The Expanse series and a book that I highly recommend, and Caliban' War is a great follow up book with no real disappointments. When I began reading this series, I understood that this was going to be a trilogy. That made me really happy. Abbadon's Gate will be the last book of this trilogy and will complete the story that started with Leviathan Wakes. However, the authors have been contracted to write five additional novellas in this world so they can complete the overall story arc. I'm excited! The books so far ARE huge, Leviathan is 592 pages long and Caliban's War has 624 pages, but the great thing about them is that the action is so fast and furious that the reading just flies by... I read Caliban's War quickly! It actually felt shorter than Leviathan, which is weird! LOL! Only 592 pages? For some reason I thought it was more than that. Not that 592 is slight, but still.. I might think about it then. Tell me.. does it have a lot of personal stories going on? Family, friendship, lovers? It don't necessarily mean romantic.. just relationships. Leviathan Wakes was a book that I really enjoyed: there wasn't a moment that I found myself really bored, and few occasions wondering why the book was drifting aimlessly: we've got a fun space opera story that's created one hell of a world to play in, with this story thundering out the gates, all guns ablaze, while touching on everything from military science fiction to romantic entanglements, and I'm already awaiting to see what happens next in The Expanse.